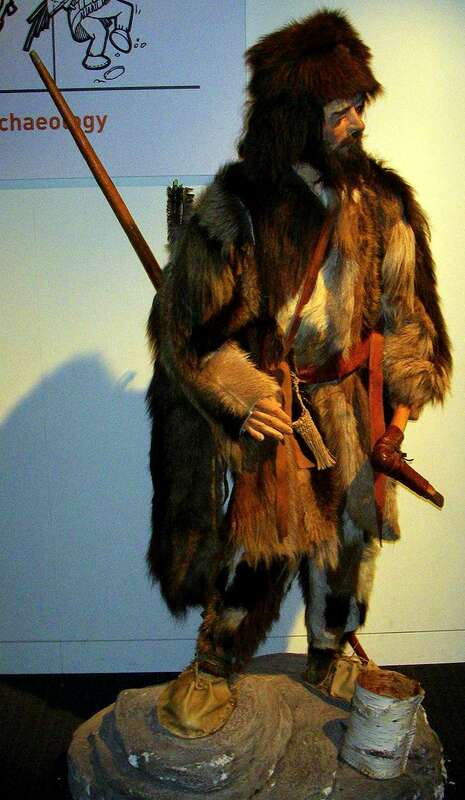 Ötzi the Iceman is a well-preserved natural mummy of a man from about 5300 BP. The mummy was found in 1991 in the Schnalstal glacier in the Otztal Alps, near Hauslabjoch on the border between Austria and Italy. The nickname comes from Otztal (Otz valley), the region in which he was discovered. 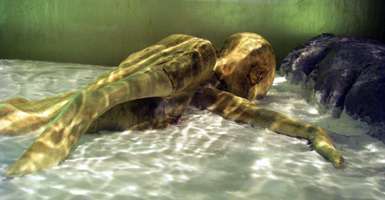 He is Europe's oldest natural human mummy, and has offered an unprecedented view of Chalcolithic (Copper Age) Europeans. The body and his belongings are displayed in the South Tyrol Museum of Archaeology in Bolzano, northern Italy. Photo (right) taken by Jerrers at the Smithsonian, Washington DC. 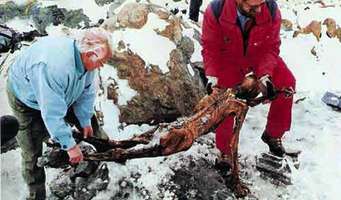 Ötzi the Iceman in situ (left) as he was found by by two German tourists, Helmut and Erika Simon, on September 19, 1991. 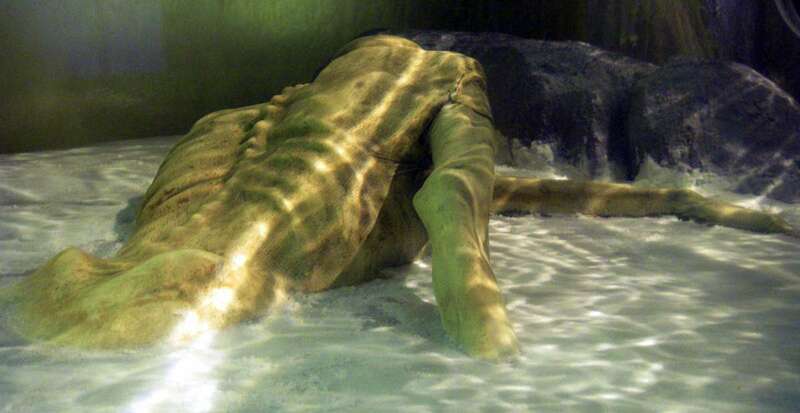 The body was at first thought to be a modern corpse, like several others which had been recently found in the region, and was treated as such, as in the second photograph (right) in which the body is carried away for identification. 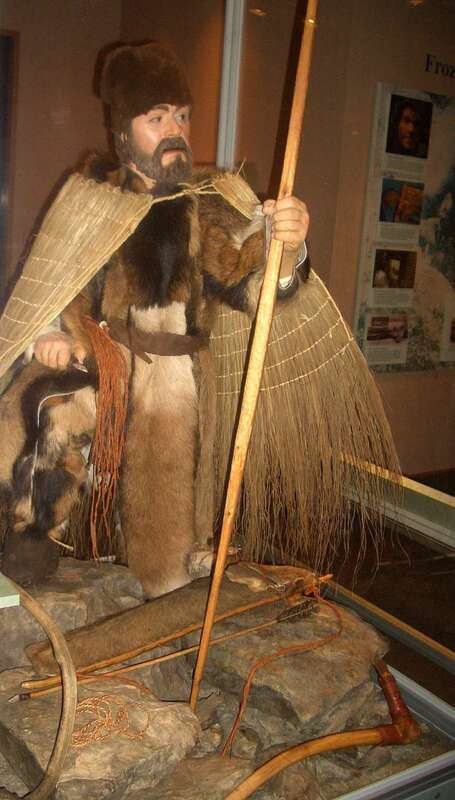 This is a beautifully made model of what Ötzi looked like, and his clothing and equipment. 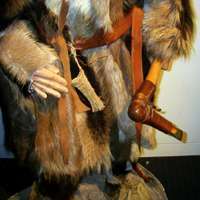 Close up of Ötzi showing his copper axe. 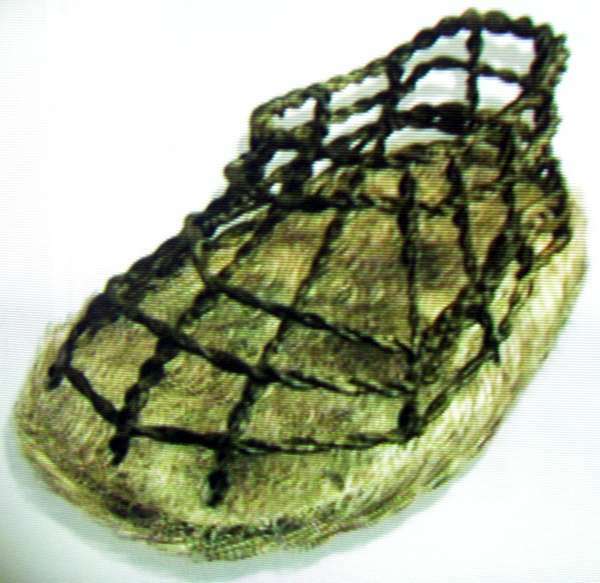 Close up of Ötzi showing his shoes, made of grass cord and leather. 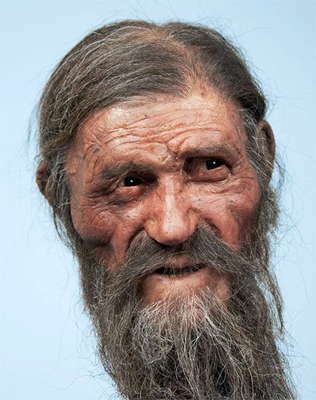 Prematurely aged, with leathery, wrinkled skin, deep-set eyes, and a shaggy beard, this new reconstruction of Ötzi the Iceman is a far cry from past reconstructions that showed him as a strapping middle-aged man. 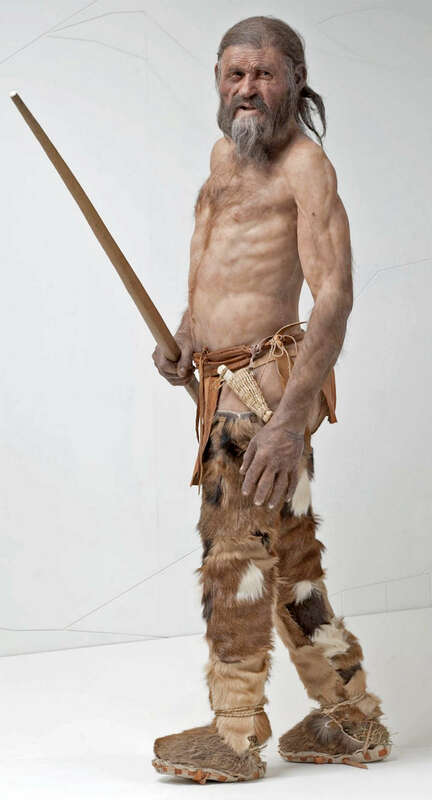 Notably, the new model, developed by Dutch artists Alfons and Adrie Kennis, has brown eyes based on recent research that showed the 5 000-year-old Iceman did not have blue eyes, as previously thought. The latest Iceman reconstruction is based on new 3-D scans of Ötzi's body and was the focus of an exhibition called 'Ötzi 20,' which celebrated the 20th anniversary of the naturally mummified body's discovery in the Italian Alps. 'Ötzi 20' ran from March 1 to January 15, 2012, at the South Tyrol Museum of Archeology in Bolzano, Italy. 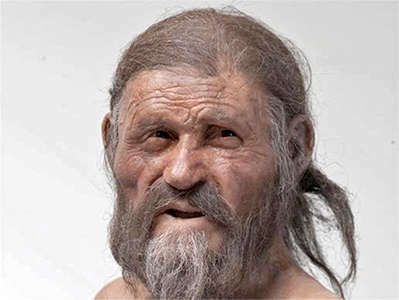 This is the latest, and supposedly most accurate, reconstruction of Ötzi, a natural mummy from the Stone Age discovered 20 years ago frozen in the Italian Alps near the Austrian border. Based on new research and the latest technology, it shows that he looked much older than his age and that his eyes were brown. Brown-eyed, bearded, furrow faced, and tired: this is how Ötzi the Iceman might have looked, according to the latest reconstruction based on 20 years of research and investigations. 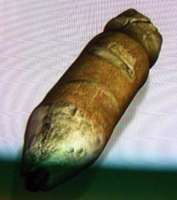 Realised by two Dutch experts, Alfons and Adrie Kennis, the model was produced with the latest in forensic mapping technology that uses three-dimensional images of the mummy's skull as well as infrared and tomographic images. The new reconstruction shows a prematurely old man, with deep-set eyes, sunken cheeks, a furrowed face and ungroomed beard and hair. Although he looks tired, Ötzi has vivid brown eyes. Indeed, recent research on the 5 300-year-old mummy has shown that the Stone Age man did not have blue eyes as previously thought. Believed to have died around the age of 45, Ötzi was about 160 cm (5 foot, 3 inches) tall and weighed 50 kilograms (110 pounds). 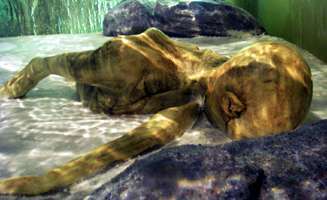 The model will go on display beginning March 1 to Jan. 15, 2012, at the South Tyrol Museum of Archaeology in Bolzano, Italy. Called 'Ötzi 20', the exhibition celebrates the 20th anniversary of the mummy's discovery. 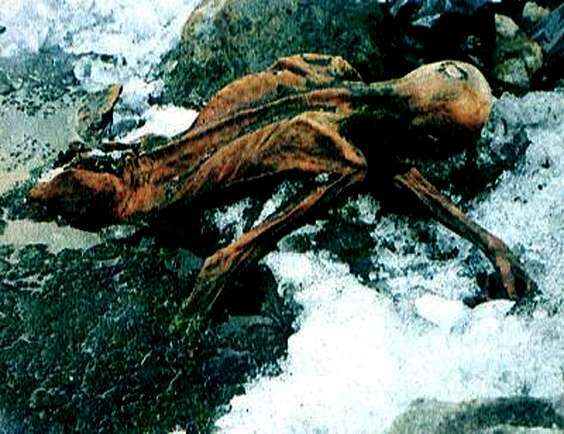 The Iceman's frozen body was found in a melting glacier in the Ötzal Alps — hence the Ötzi name — on Sept. 19, 1991. Text: Rossella Lorenzi. 'The Iceman Mummy: Finally Face to Face'. Discovery News, February 25, 2011. 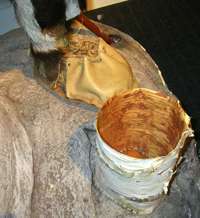 One of the two birch bark containers that Ötzi had with him. Close up of the quiver and the fletchings on the arrows Ötzi had with him. 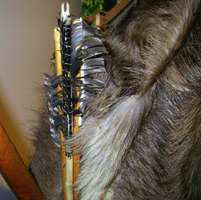 The recreators of the arrows seem to have used two methods for attaching the feathers. 1. They seem to have cut a groove in each side of the shaft of the arrow, and glued a half feather into the groove. 2. 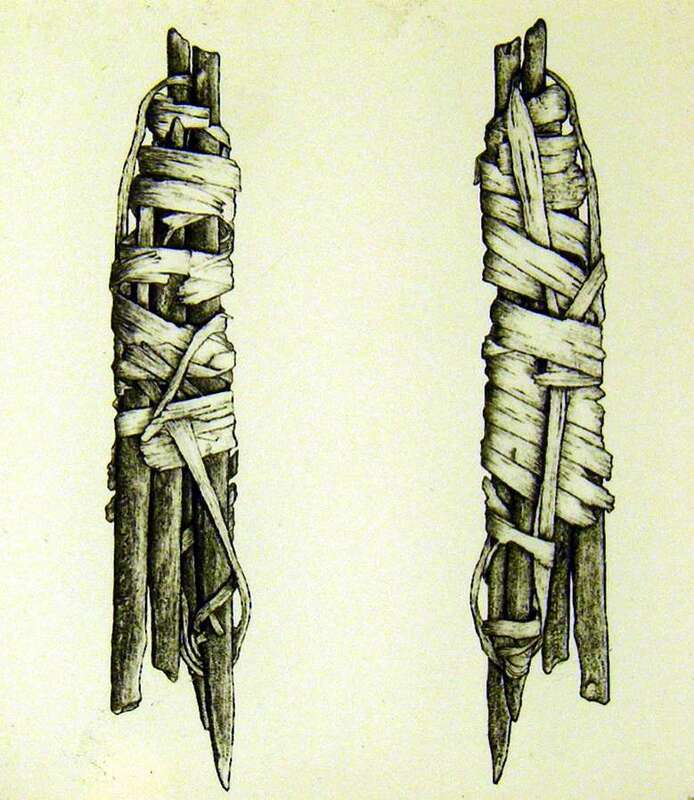 They also seem to have attached the feathers merely by binding the feathers on to the shaft. 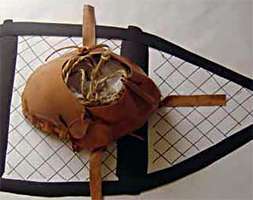 Notice also what appears to be a piece of bone attached with cord to the end of the arrow, with a groove carved in it to accept the bow string. 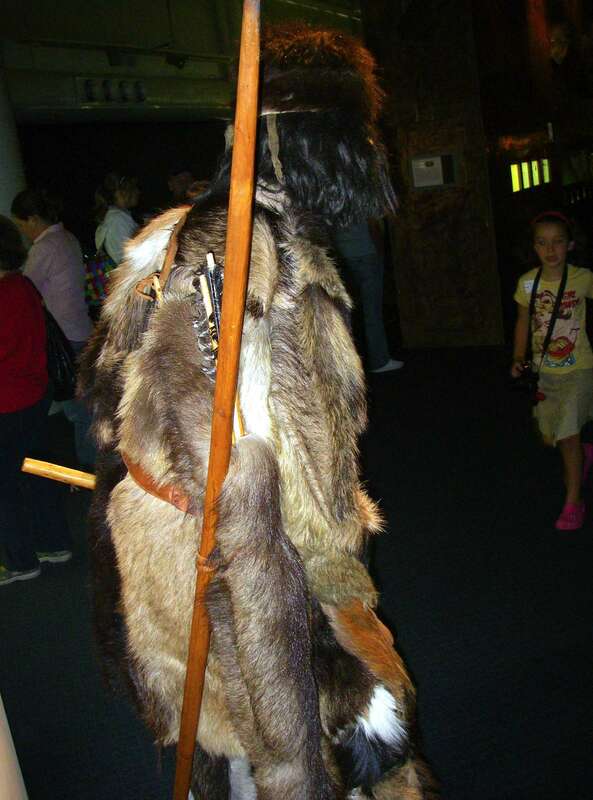 View of the quiver and Ötzi's back and clothing. Rear view showing hat, quiver, arrows, bow and clothing. 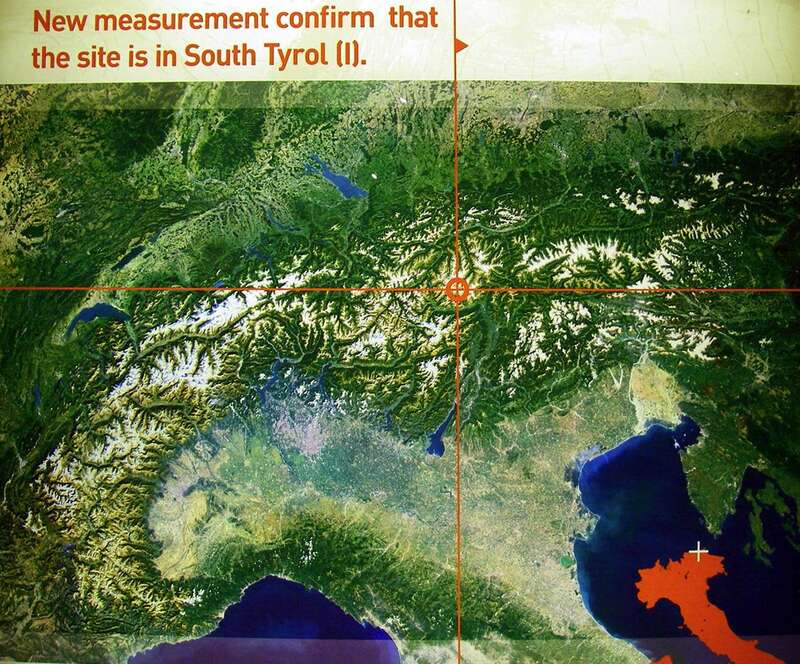 Where Ötzi was found, in the South Tyrol, in the Italian Alps. 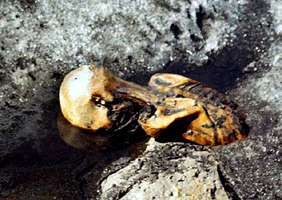 Ötzi in situ in the glacier. He was thought at first to be a modern human. Another photograph of Ötzi before being removed from the site. 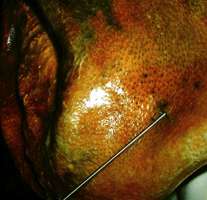 Ötzi's death - a case of homicide? 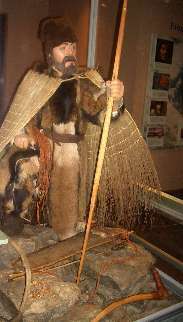 Ötzi died from an arrow wound. For a long time the arrowhead remained hidden. 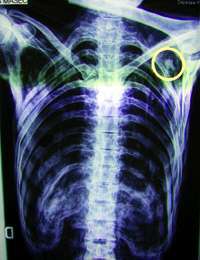 It was not discovered until 2001 when new x-rays were analysed. The arrow had been shot from behind and from a considerable distance. 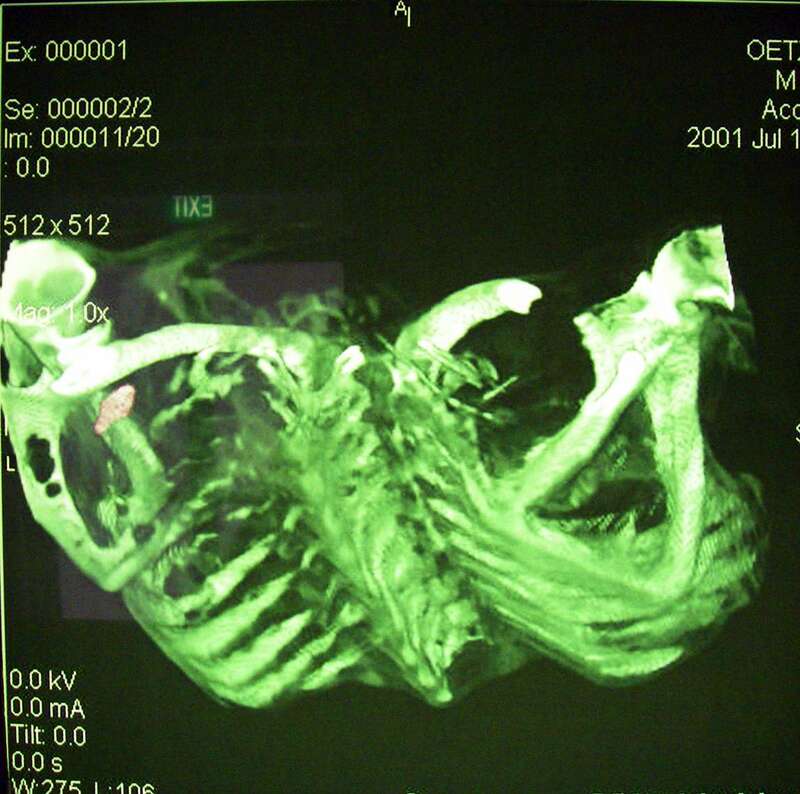 It penetrated the left shoulder blade but was stopped by tissue just short of the left lung. 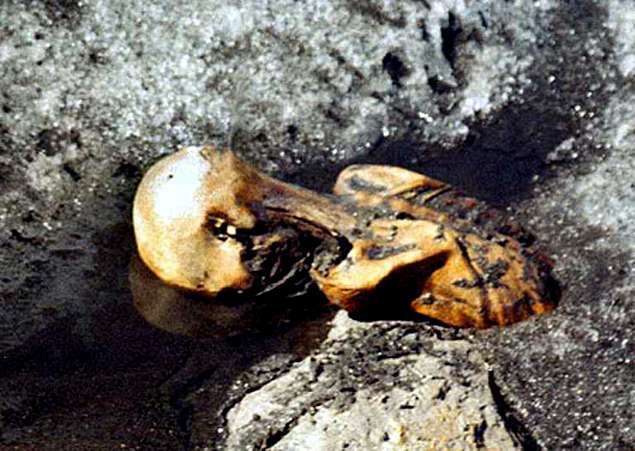 Ötzi lost a great deal of blood. His wound was agonisingly painful and his left arm was probably paralysed. He struggled with death for hours. No trace of the culprit has been found. X-ray (or ultrasound?) of Ötzi's chest, with the arrow head which killed him shown on the left in a different colour. Another X-ray of Ötzi's chest, with the arrow head which killed him shown circled. The steel rod shows the point of entry of the arrow. A superb recreation of what Ötzi looked like when first found. 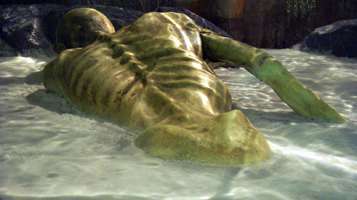 The effect is obtained by having the model inside a translucent case, with viewing ports, to give the impression of a body encased in ice. The copper axe - weapon or symbol? Ötzi's best item was his copper axe. 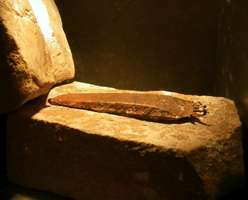 It is unique in being the only perfectly preserved prehistoric axe in the world. Because of the soft copper cutting edge, it was initially assumed that the axe was an emblem of rank, a status symbol of a warrior or chieftain which only the elite could carry. 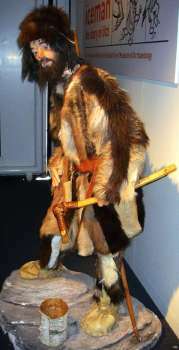 However, wear patterns on the axe and experiments with a reconstructed axe showed that Ötzi's axe was capable of felling trees. Here is how the axe could have been cast, by pouring molten copper into a sandstone mold. 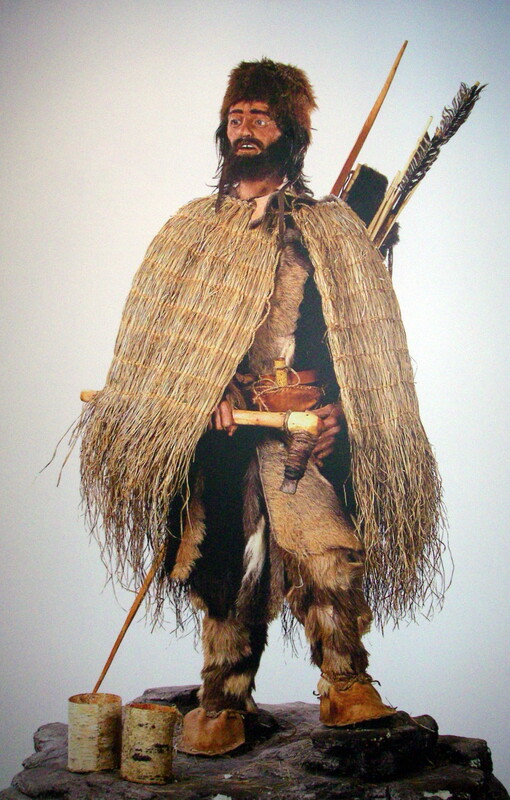 Ötzi carried with him everything he needed to kindle a camp fire and fashion weapons. His equipment allowed him to remain away from his home for long periods. In his belt pouch he carried tinder for starting fires as well as flint blades and drills. A touch up tool served to resharpen the blades. 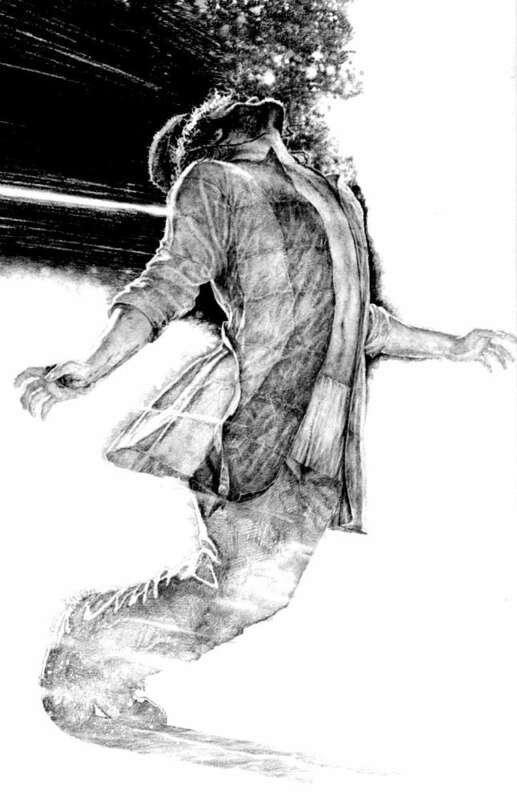 He carried a dagger in a finely braided bast scabbard hanging from his belt, where it was always to hand. His quiver contained animal sinews, a bundle of antler tips and 14 arrow shafts, two of which were ready to shoot and 12 unfinished. The bow was also unfinished. The photos at left show the bundle of antler tips. 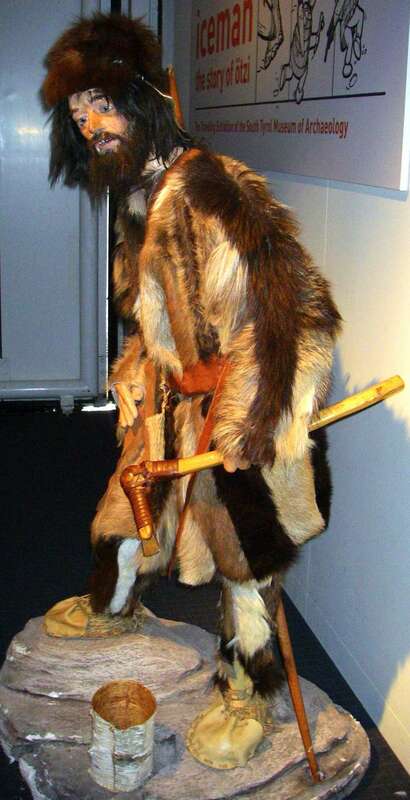 Ötzi's equipment was made of natural materials such as leather, wood and grass. The variety of woods used is astonishing. Evidently the most suitable material was selected for each item: tough resin-free yew for the bow and the axe haft, straight grained wood for the dagger handle, resilient hazel for the bent pack frame. 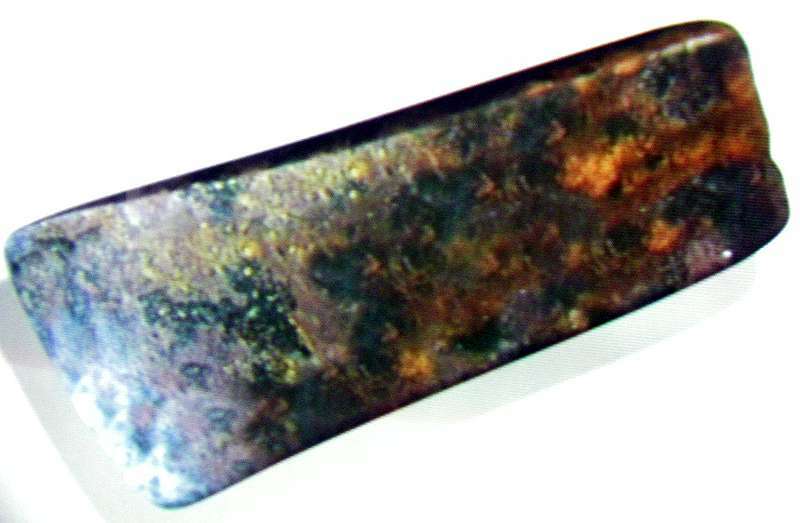 People of the copper age had detailed knowledge of materials, much of which is lost to our modern civilisation. 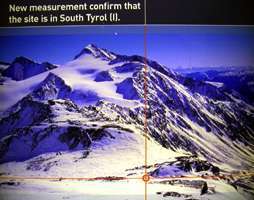 Ötzi lived south of the main Alpine ridge. 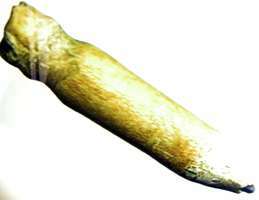 This is indicated by pollen, teeth and wood analyses as well as his flints, which came from the Lake Garda region, and his axe, whose shape is known from the Remedello culture on the Po plain. Ötzi could have been a member of the Tamins-Carasso-Isera 5 Alpine cultural group, which settled in the Vinschgau Valley. If only Oti had also taken along a piece of stoneware or ceramic with him a clear regional classification would have been possible, as every cultural group had a unique way of shaping, decorating and firing clay. Ötzi's knife, flint hafted on wood. 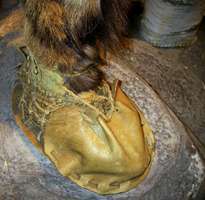 Construction of Ötzi's shoes. They appear to have had grass inner soles for warmth, covered with tough bearskin leather outer soles, with woven grass cords with grass woven between the cords on top to hold the foot and keep it warm, and with a deerskin leather 'apron' in front to protect the foot from snow. This version of Ötzi's shoes imagines them as being part of a snowshoe. 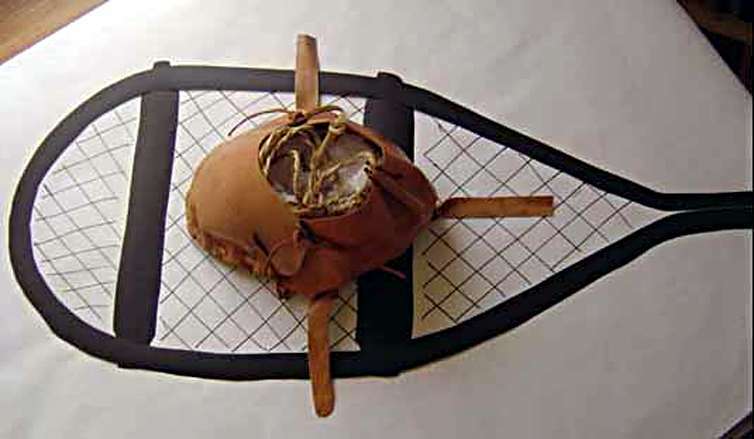 The shoes were waterproof and wide, seemingly designed for walking across the snow; they were constructed using bearskin for the soles, deer hide for top panels, and a netting made of tree bark. Soft grass went around the foot and in the shoe and functioned like warm socks. The shoes have since been reproduced by experts and found to constitute such excellent footwear that there are plans for commercial production. Touching up tool for sharpening flint blades. 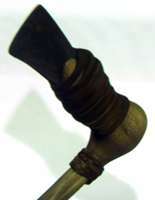 The handle is made from lime wood, Tilia sp., with a small piece of deer antler hardened in the fire set into it. This is a tinder fungus, Fomes fomentarius which is used to start fires. It is ground to a fine powder and is used as tinder with flint and iron pyrite. 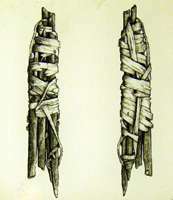 The flint is struck on the iron pyrite, which creates a spark, which with care can be made to land in the prepared fungus and blown to an ember. This was a standard method of starting a fire in the Neolithic. The tinder fungus in the pouch of Ötzi contained iron pyrite particles, but no iron pyrite was found with Ötzi. 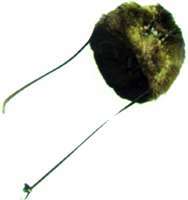 If it is hammered flat, it can be turned into something like felt. It can then be kept smouldering, allowing the user to transport fire easily from one place to another. For those inclined to put ink to flesh, modern tattoo parlours offer dizzying arrays of dyes – mercury-containing reds, manganese purples, even pigments that glow in the dark. Getting inked wasn't always quite so complicated, however. 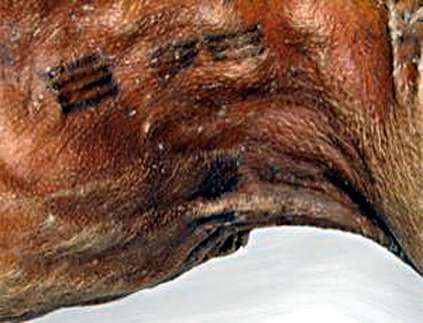 A new analysis concludes that the world's oldest tattoos were etched in soot. Clothing would have obscured most of the designs, which are of crosses and bands of lines. Some are located near acupuncture points. 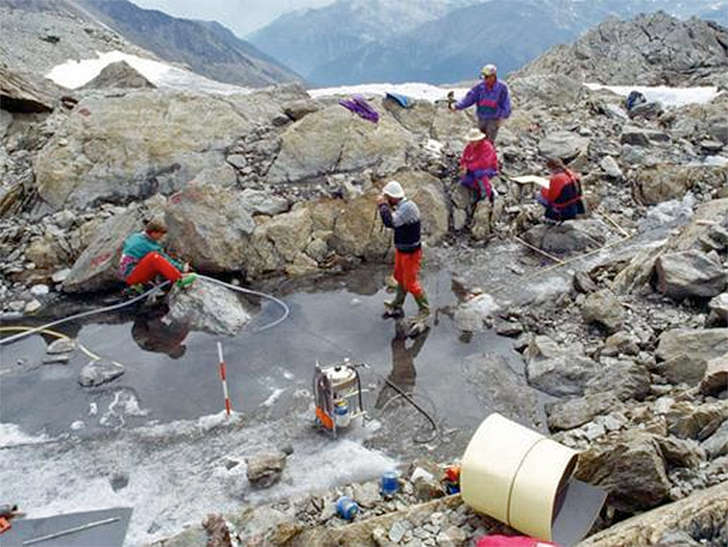 Alpine climbers discovered Ötzi near the Italian-Austrian border in 1991. Since then, scientists have analysed his clothing, diagnosed him with various ailments – arthritis, back and stomach problems – and even sequenced his mitochondrial genome. To work out what Ötzi's tattoos were made of, Pabst's team applied light and electron microscopes to minutely thin sections of several tattoos as well as a non-tattooed flesh from his inner thigh. A close look at his tattooed skin revealed numerous fine particles, interspersed with elongated crystals. Chemical analysis indicated that the particles were made of double-bonded carbon atoms found in soot, while the crystals were made of silicate. His tattoo-free skin, on the other hand, showed no trace of soot particles. Ötzi's "ink" could have been scraped off silicate-containing rocks surrounding a fireplace, Pabst says. "When you look at the body of the iceman – I was there when the body was taken out – you can't see anything that tells you how [the tattoos] were made," she says. 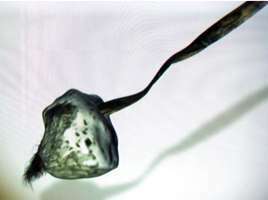 Perhaps, Ötzi's brethren used thorns to pierce the skin deeply enough to inject a soot ink. The following text and graphics are adapted from the National Geographic Magazine, July 2007 from an article by Stephen S. Hall, with artwork by Kazuhiko Sano. 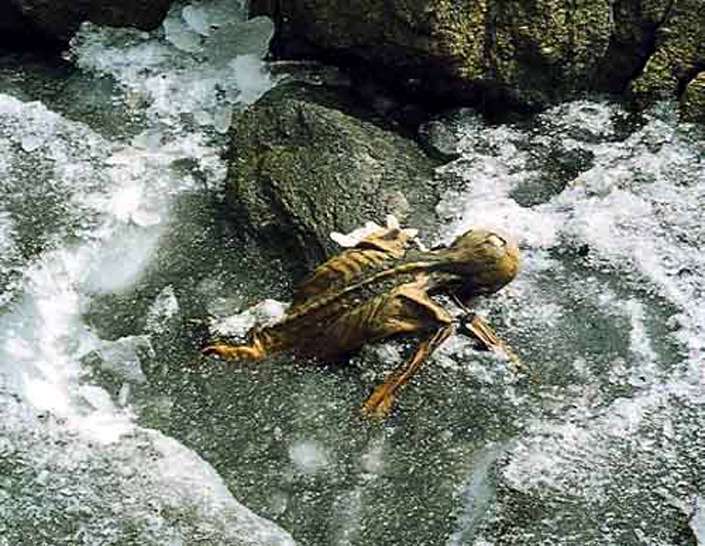 Perfect conditions - glacial meltwater, drying wind and sun, the blanketing snow and ice - preserved and mummified the Iceman's body, and the high ravine protected it as a glacier grew overhead. Exceptionally warm weather eventually melted the ice and allowed him to be found. 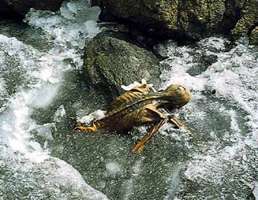 The Iceman died at a pass in the Ötztal Alps - hence his nickname, 'Ötzi'. Trace elements in his teeth and bones reveal that he lived as an adult in the Val Venosta, some 12 miles to the south, and that he grew up nearby in the Valle Isarco. It was late spring or early summer, when a modest tree called the hop hornbeam unfurls bright yellow clusters of flowers in the steep valleys that run north into the mountains now known as the Italian Alps. The man hurried through a forest he knew well, wincing from the pain in his injured right hand and pausing occasionally to listen for sounds that he was being pursued. As he fled up the slope, the yellow pollen of the hornbeam blossoms fell like an invisible rain, salting the water and food he consumed when he stopped to rest. 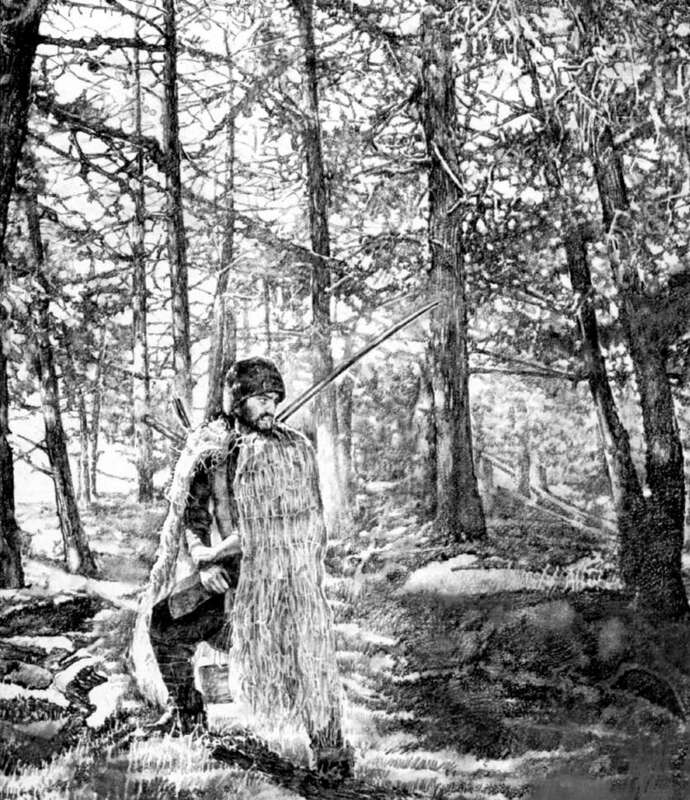 Five thousand years later, the Neolithic hunter we call the Iceman would still bear traces of this ancient dusting inside his body—a microscopic record of the time of year it was when he passed through this forest and into the nearby mountains, where fate would finally catch up with him. Photo: National Geographic Magazine, July 2007 from an article by Stephen S. Hall, with artwork by Kazuhiko Sano. We know that he was a small, sinewy, and, for his times, rather elderly man in his mid-40s. Judging from the precious, copper-bladed ax found with him, we suspect that he was a person of considerable social significance. 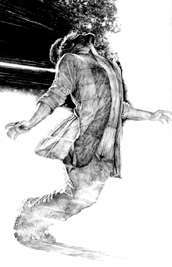 He set off on his journey wearing three layers of garments and sturdy shoes with bearskin soles. He was well equipped with a flint-tipped dagger, a little fire-starting kit, and a birchbark container holding embers wrapped in maple leaves. 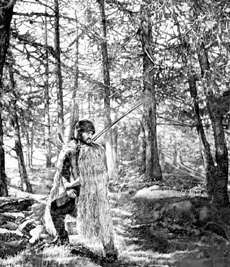 Yet he also headed into a harsh wilderness curiously under-armed: The arrows in his deerskin quiver were only half finished, as if he had recently fired all his munitions and was in the process of hastily replenishing them. And he was traveling with a long, roughly shaped stalk of yew—an unfinished longbow, yet to be notched and strung. Why? Using a sophisticated analysis of isotopes in one of the Iceman's teeth, for example, scientists led by Wolfgang Muller have shown that he probably grew up in the Valle Isarco, an extensive north-south valley that includes the modern-day town of Bressanone. Isotope levels in his bones, meanwhile, match those in the soil and water of two alpine valleys farther west, the Val Senales and the Val Venosta. 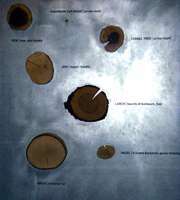 Muller's team has also analyzed microscopic chips of mica recovered from the Iceman's intestines, which were probably ingested accidentally in food made from stone-ground grain; geologic ages of the mica best match a small area limited to the lower Val Venosta. The Iceman probably set off on his final journey from this very area, near where the modern-day Adige and Senales Rivers meet. We also know that he was not in good health when he headed up into the mountains. 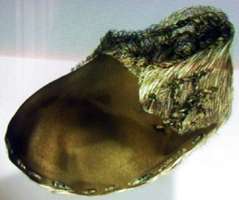 The one surviving fingernail recovered from his remains suggests that he suffered three episodes of significant disease during the last six months of life, the last bout only two months prior to his death. Doctors inspecting the contents of his intestines have found eggs of the whipworm parasite, so he may well have suffered from stomach distress. But he was not too sick to eat. 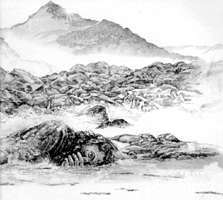 A day or two before his death, the Iceman had eaten a piece of wild goat and some plant food. The same analysis revealed that his very last meal was red deer and some cereals. The archaeobotanist Klaus Oeggl has concluded from bran-like food residues that the Iceman's diet also included the primitive form of wheat known as einkorn as well as barley, found on his garments, indicating that the Neolithic settlements south of the Alps where he lived cultivated these grains. Oeggl has even found that the small size of the wheat fragments in the gut, along with tiny flecks of charcoal, suggest that the grains were ground and then baked as primitive bread in open fires. The evidence strongly indicates that the Iceman's last journey began in the low-altitude deciduous forests to the south, in the springtime when the hop hornbeams were in bloom. When he reached a mountain pass now known as Tisenjoch, he likely paused to rest. 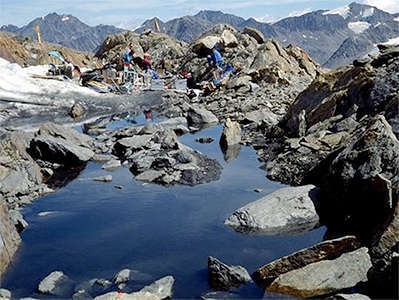 He had completed a vertical climb of 6,500 feet (2,000 meters) from the valley below, and to the north faced a desolate, glacier-riven landscape. Perhaps the rocky hollow where he found himself offered some shelter from the wind. We do not know if his enemies caught up with him at that spot, or were waiting there in ambush for him to arrive. What we do know is that he never left that hollow alive. Photo: National Geographic Magazine, July 2007 from an article by Stephen S. Hall. A stone arrowhead was found lodged beneath the Iceman's left shoulder blade. 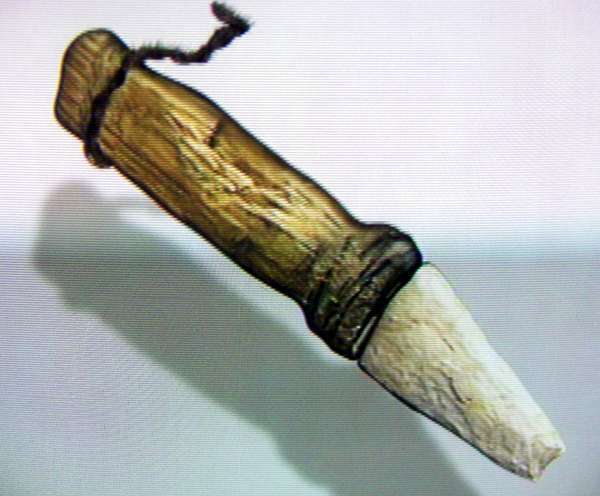 The sharpened piece of stone, probably flint, had made a half-inch gash in the Iceman's left subclavian artery. This is the main circulatory pipeline carrying fresh oxygenated blood from the pumping chamber of the heart to the left arm. Such a serious tear in a major thoracic artery would almost certainly lead to uncontrolled bleeding and rapid death. "This is a lethal wound," Rühli says. "It was pretty quick. With this kind of bleeding, you don't go walking uphill for hours." 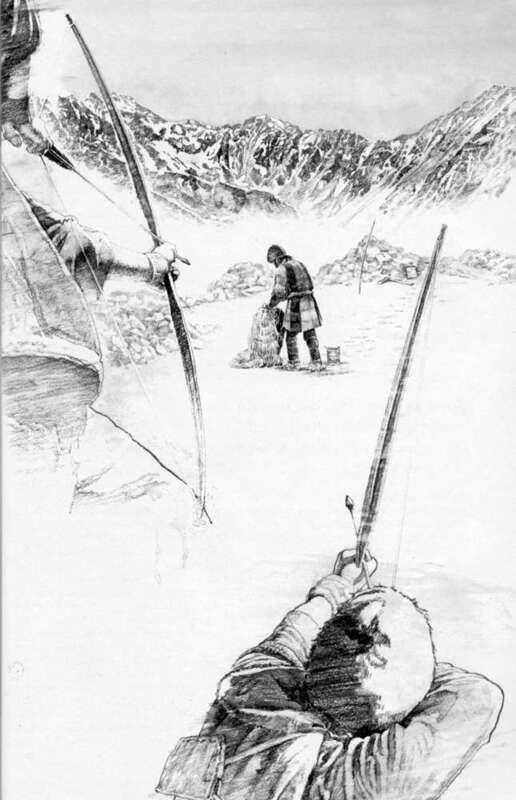 This new medical evidence suggests that an attacker, positioned behind and below his victim, fired a single arrow that struck the Iceman's left shoulder blade—precisely the area at which prehistoric hunters aimed to bring down game with one shot. The arrow went clean through the bone and pierced the artery. Blood instantly began to gush out, filling the space between the shoulder blade and the ribs. In his few remaining minutes of life, the Iceman became a textbook case of what is now known as hemorrhagic shock. His heart started to race. Sweat drenched his garments, even at an altitude two miles (three kilometers) above sea level. He felt increasingly faint because not enough oxygen was reaching his brain. In a matter of a few minutes, the Iceman collapsed, lost consciousness, and bled out. 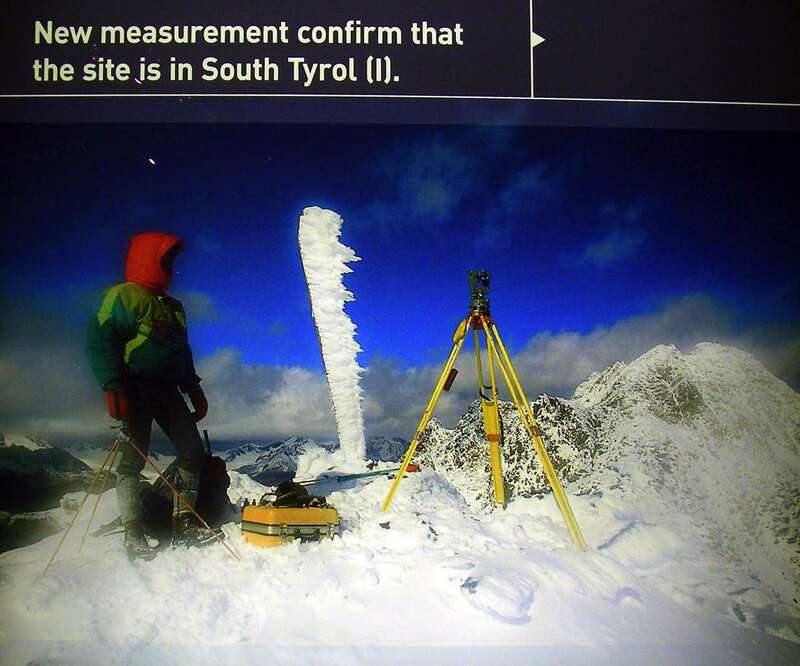 Then, in a fantastically fortunate cascade of circumstance, the brutal weather of the Otztal Alps conspired with chance to perform one of the greatest embalming jobs in the history of human remains. 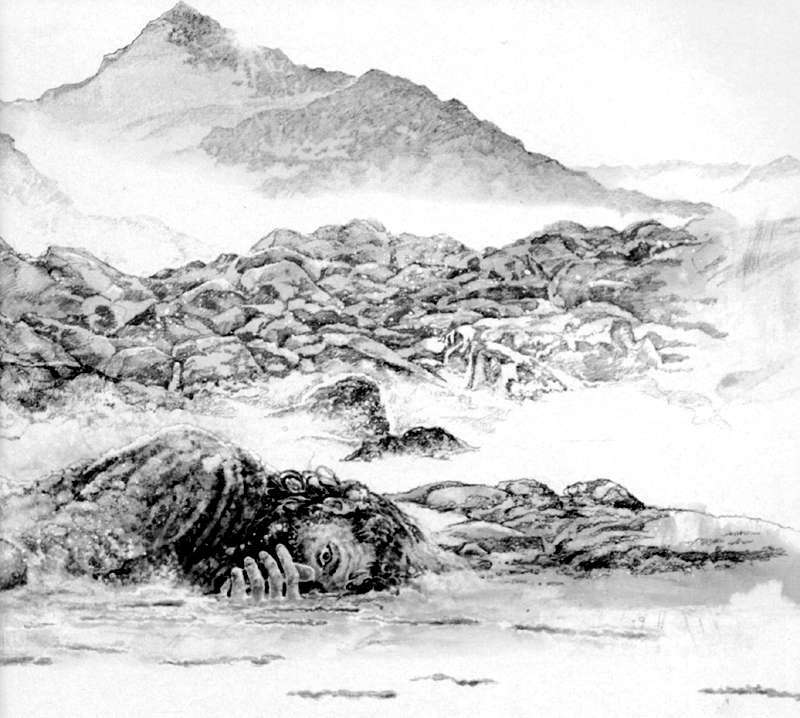 The frigid glacial environment eventually tucked him in like a cold, wet blanket, immobilizing and preserving his body in snow, ice, and glacial meltwater. The little ravine protected his lifeless form from the bone-grinding action of the Niederjoch Glacier, which passed just a few feet overhead for the next 5 300 years. Experts now believe that the mystery may hinge on a bizarre detail of the crime scene. The shaft of the fatal arrow was nowhere to be found. Someone must have pulled it out, leaving behind the stone arrowhead lodged in his body. It is possible that telltale markings in the construction of prehistoric arrows could be used to identify the archer much in the way that modern-day ballistics can link a bullet to a gun. 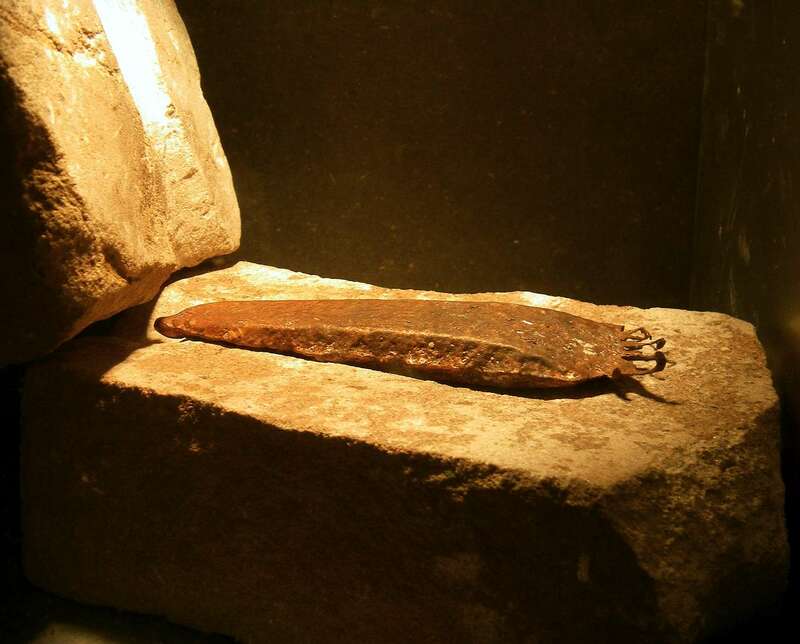 For similar motives, the attacker did not run off with any of the precious artifacts that remained at the scene, especially the distinct copper-bladed ax; the appearance of such a remarkable object in the possession of a villager would automatically implicate its owner in the crime. 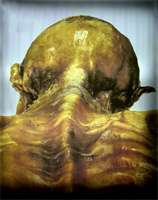 http://www.icemanphotoscan.eu/ is a site which provides high resolution photos of Ötzi the iceman. They are superb. Walter Leitner, an archaeologist at the University of Innsbruck believes the bloody mountaintop confrontation was the denouement of a political dispute that began down in the valley, where rivals within the Iceman's own tribe tried to assassinate him. 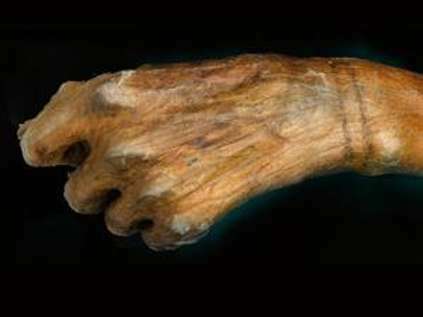 A microscopic analysis of the Iceman's hand wound, and the fact that it had begun to close and heal, suggests that it occurred well before the final mortal blow. 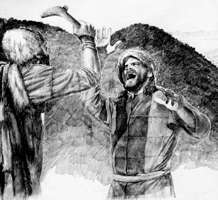 "So there must have been some fight, some kind of battle, at least one day—and perhaps even two or three days—earlier," said Egarter Vigl. "The time had come where his opponents had become stronger," Leitner speculates, "but he didn't recognize that his reign was coming to an end and was holding on to his position." Leitner says that after the fight in the village, "It looks as if the Iceman was planning to flee and that his trip was brought to an end by his opponents." Ötzi the Iceman has at least 19 living male relatives in the Austrian Tirol, according to a genetic study into the origins of the people who now inhabit the region. Scientists from the Institute of Legal Medicine at Innsbruck Medical University analyzed DNA samples taken from 3,700 blood donors in the Tyrol region of Austria. During their study, they discovered that 19 individuals share a particular genetic mutation with the 5,300-year-old mummy, whose full genome was published last year. 'These men and the Iceman had the same ancestors,' Walther Parson, the forensic scientist who carried out the study, told the Austrian Press Agency. The researchers focused on parts of the human DNA which are generally inherited unchanged. 'In men it is the Y chromosomes and in females the mitochondria. Eventual changes arise due to mutations, which are then inherited further,' Parson explained. People with the same mutations are categorised in haplogroups. Designed with letters, haplogroups allow researchers to trace early migratory routes since they are often associated with defined populations and geographical regions. Indeed, Ötzi’s haplogroup is very rare in Europe. 'The Iceman had the halogroup G, sub category G-L91. In our research we found another 19 people with this genetic group and subgroup,' Parson said. Having carried out the Y chromosome haplogroup analysis, Parson was able to trace only the male descendants of the Neolithic man. 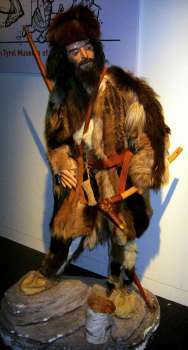 So far the 19 individuals have not been informed of their genetic relationship to Ötzi. Found in 1991 in a melting glacier in the Ötztal Alps (hence the name), the mummy is one of the most heavily investigated human corpses of all time. Scientists discovered that Ötzi had brown eyes and very bad teeth, was lactose intolerant, had a genetic predisposition for an increased risk for coronary heart disease and probably had Lyme disease. It’s certain he died a violent death: In 2007, CT scans showed that an arrowhead had lacerated his left subclavian artery, leading to fast bleeding. 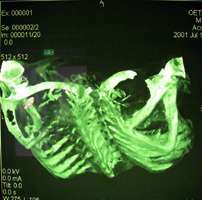 CAT scans of the mummy’s brain and a paleoproteomic study have recently pointed to a cerebral trauma — a violent blow to the head — as the cause of death. As investigation into the mummy continues, new relatives, alive and well, could be added to the list of the 19 descendants. 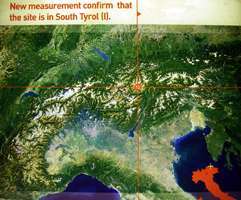 According to Parson, the genetic mutation might be also found in the nearby Swiss region of Engadine and in Italy’s South Tyrol region. 'We have already found Swiss and Italian partners so that we can continue our research,' he said. Between July 20 and Aug. 25, 1992, a second archaeological survey was carried out at the glacier. 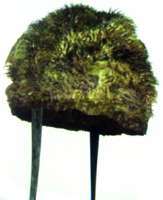 Numerous pieces of the Iceman's equipment emerged, such as a bearskin cap, leather and hide remnants, grasses, string, pieces of skin, muscle fibres, hair and a fingernail. Although the most important piece in the Iceman's equipment is a copper-bladed axe (tests have shown it could have chopped down a yew tree in 35 minutes) this stone disc is the most mysterious. Made of white Dolomite marble, it has a hole in the middle through which a hide strip was threaded. 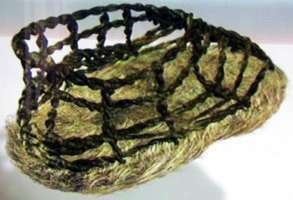 Nine twisted hide thongs were tied on to a loop in this strip. What at first glance resembled a talisman has today been identified as a bird belt. 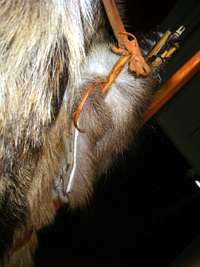 In bird hunting, birds that have been killed are hung by the head from a loop on a belt. 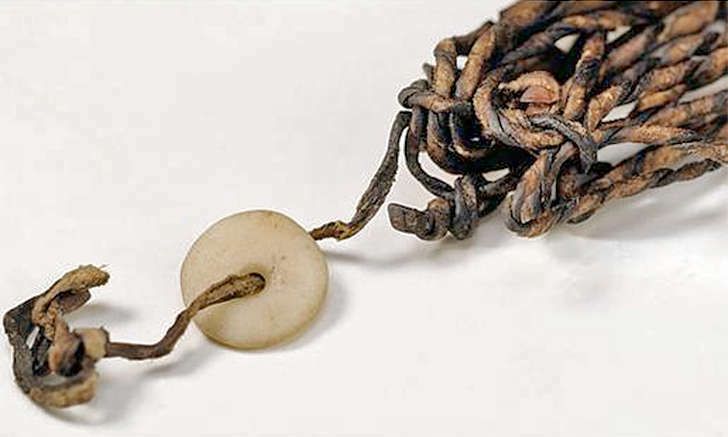 The stone disc was attached to the back of Ötzi’s belt with the aid of the stone disc. 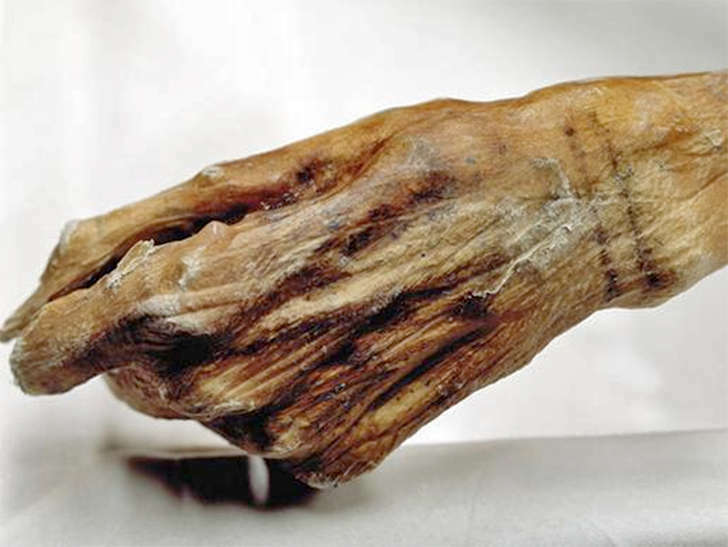 Oetzi's body is covered with over 50 tattoos produced by fine incisions into which charcoal was rubbed. The cuts were probably part of a pain-relieving treatment. Indeed, the tattooed areas correspond to skin acupuncture lines. 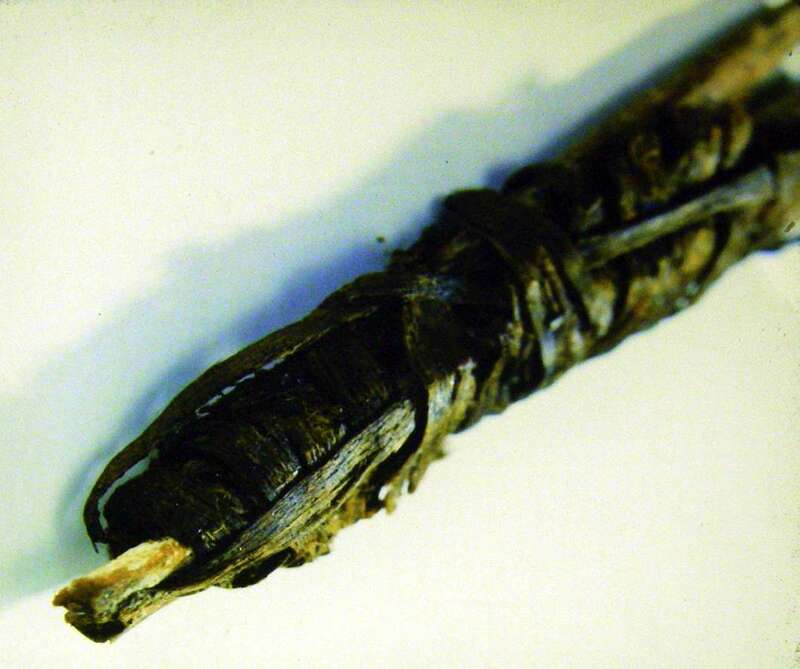 Before Oetzi, it was believed that acupuncture originated 2 000 years later in Asia.